For all Muslims the Hajj is one of the pillars of faith; every Muslim man and woman is required to perform the Hajj at least once in their lifetime after attaining adulthood. Alongwith the Hajj is the Umra. This too is a pilgrimage to Makkah (in what is now Saudi Arabia) but a lesser one, and can be performed at any time during the year; whereas the Hajj only takes place from the 8th to the 13th of Zil-Hajjah al-Haraam – the last month in the Islamic calendar. That time is upon us and in among the millions of Muslims who are presently in Makkah to perform the Hajj are a contingent of several thousand Dawoodi Bohra Muslims from all over the world. The Hajj is one of the single largest congregations of people seen anywhere in the world. It is a remarkable phenomenon to witness i- regardless of whether one believes in this faith, another faith or no faith at all; inthe concert of actions, the unceasing, mesmerising circumambulation of the Kaaba – the House of Allah – by tens of thousands of men, women and children in unison at any given moment. The sheer harmony of the humanity that has come together in this one place at one time is breathtaking. Among these many Bohra hujjaj (Haj pilgrims) is Huzefa Mogul, a chartered accountant from the US. He has been living there for the past 17 years and is married with two daughters aged 14 and 11. The challenges of his profession notwithstanding he is also active within the community. He is the secretary of the local Shabab al-Eid al-Zahabi, (the youth-oriented organization of the Bohras) and also a member of the Taiseer al-Nikah Committee (TNC) which serves to organize match-ups for those wanting to get married. Huzefa is also the procurement manager for his jamaat. As with anyone for whom life is about more than just work, Huzefa has to find that delicate balance between his work schedule and religious obligations by which he hopes to make a significant contribution in this world, and at the same time, accumulate reward for the Hereafter. Although he has visited several other sacred places of pilgrimage before, this will be the first time he is going to Makkah, where his focus will entirely be on the Hajj; worldly matters and concerns will be left behind for that entire period of time. Through these words, Huzefa summarizes the belief shared by all Bohras, one which is frequently elucidated by His Holiness Dr. Syedna Mufaddal SaifuddinTUS and his noble predecessors, that Imam Husain sacrificed everything in Karbala for the survival of Islam AS so that we may attain salvation, and that sacrifice constantly inspires us to contemplate what lies beyond the limits of the material world. In today’s world, although a majority possess the ability to travel as defined by the ImamAS, they are largely deterred by a lack of time. For those that fall in this category, deferral is no longer an option which is truly compatible with the stipulations of their faith. There are many who rue the fact that they did not make the pilgrimage when they could, for they are now unable to do so due to deteriorating health and old age. For Huzefa, that time had come and his realization of the obligation to go-ahead and fulfil this tenet of Islam at the earliest opportunity was evidence of his reaching a spiritual as well as financial maturity. When asked about his arrangements at home while he would be traveling Huzefa says, that since his daughters were on summer break, they would be staying at a relative’s house. He has prepaid his bills, wrapped up his projects and assigned his pending workload to other managers. The procurement duties for the community have also been reallocated till his return. 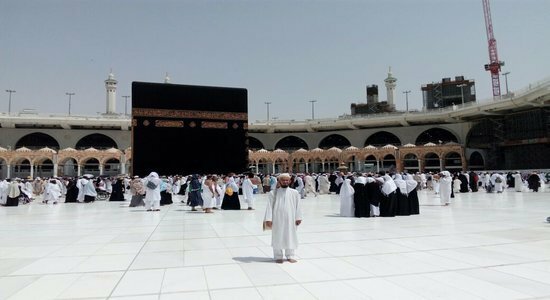 Huzefa is now preparing to start the Hajj itself, after a fortnight in the holy cities of Makkah and of Medina, which was the capital of the ProphetSA after emigrating there due to persecution in Makkah in the early days of Islam. He has performed an Umra and each day and night will have been spent in tawaaf (circumambulations) of the Kaaba, recitation of the Quran and prayer. Now the Hajj itself begins on the night of the 9th and will continue in various parts of Makkah for 3-5 days. We wish all hujjaj – of all Islamic denominations – Haj and Eid Mubarak and best wishes for their health and safe return to their homes.